The number of Indian nationals visiting New Zealand rose from 34,672 in 2014 to 67,072 in 2018 (years ending October). When this is expanded to include all visitors from India to New Zealand, the counts increase to 36,144 in 2014 and 68,784 in 2018. The growth of Indian visitors to New Zealand, whose numbers nearly doubled between 2014 and 2018 (The Indian Express, March 23), has been driven mostly by tourists, and New Zealanders’ Indian relatives or friends. New Zealand government data show that visits by senior citizens (age 55-64) have increased most significantly, multiplying nearly 2½ times between 2014 and 2018. The number of Indian nationals visiting New Zealand rose from 34,672 in 2014 to 67,072 in 2018 (years ending October). When this is expanded to include all visitors from India to New Zealand, the counts increase to 36,144 in 2014 and 68,784 in 2018. 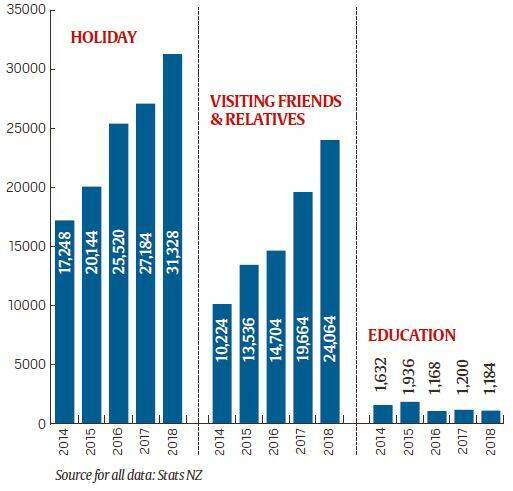 Holidaymakers and visiting friends and relatives make the bulk of the 2018 visitors. Their count doubled from 27,472 (17,248 on holiday and 10,224 visiting friends and relatives) in 2014 to 55,392 (31,328 and 24,064) in 2018. Significantly, the student segment saw a drop from 1,632 education-related visits in 2014 to 1,184 in 2018. Business trips rose by half while visits for conferences more than doubled. In terms of age profile of visitors from India, the largest group remains 25-34 years, with the numbers increasing from 9,248 to 15,776. However, the second largest group (55-64) has seen a much more drastic increase in numbers, from 6,336 to 15,600. Amid continuing uncertainty over how and when Brexit will eventually take place, two new books look at the inevitability from different perspectives. A Short History of Brexit: From Brentry to Backstop is economic historian Kevin O’Rourke’s chronicle of the events leading up to Brexit, looking at the evolution of British attitudes to Europe, the EU’s politics and economics, and focusing on the question of the Irish border. Dreams of Leaving and Remaining is a collection of essays by journalist James Meek, written for the London Review of Books in the years before the UK voted to leave the EU, and annotated with Meek’s current reflections. These essays look at the perspectives of various people on both sides of the Brexit divide. 2 Explained: Golan Heights; Where are they, and why do they matter?